While average attendance rates per month are fairly consistent between September and April, in some schools a troubling pattern starts in the Spring and worsens in June. The reasons for this attendance slump vary. Sometimes teachers prefer to use the last weeks of school to prepare for the next school year. In other places parents might not understand the full value of the final weeks of school and pull students out to begin summer vacations early. 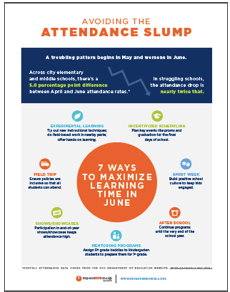 TASC and ExpandED Schools developed Avoiding the Attendance Slump: Strategies to Maximize Learning Time in June – A Resource Guide, for schools in New York. The guide provides insight into the drop in attendance from April – June, specific strategies to increase learning time and attendance rates, minimize summer learning loss, and accelerate performance in the next grade. Check out the guide and one-page infographic below!